What About the Confessions and Catechisms? One thing that the Reformed and Presbyterian churches are known for is the confessions and catechisms. 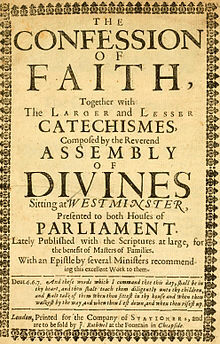 The Presbyterian churches tend to subscribe to the Westminster Standards, which consists of the Westminster Confession of Faith and the Westminster Larger and Shorter Catechisms. The Reformed churches lean more towards the Three Forms of Unity, which consists of the Belgic Confession of Faith, Canons of Dort, and Heidelberg Catechism. One question I often hear regarding the confessions and the catechisms is why do we have them? Is the Bible not enough? Of course, the Bible is enough and we always need to remind ourselves that the confessions and catechisms are subject to the authority of Scripture. The confessions are not there to compete with the Bible rather they are there to aid in understanding various doctrines of the Bible. They don’t have their own authority. Their authority is derived from the truths of Scripture contained in them. Catechisms are also essential tools when it comes to shepherding and teaching the little hearts of our children. I have in mind here the shorter catechism and the Catechism for Young Children. These summarize the key doctrines of the Bible in simpler terms that even a child can understand. But make no mistake to think that since they were written mainly with children in mind then adults cannot benefit from them. To the contrary many adults have also benefited from reading and memorizing these catechisms. When I was a child, my grandfather bought me the shorter catechism and taught me God’s truth from it. I imbibed and memorized its truths with the innocent zeal of a child. Later in my teenage years I wandered away into the world but the Spirit of God continued to use those truths stored in my mind to convict me of my sin and eventually begin the gracious work of bringing me back to faith. Lastly but not least, the confessions and catechisms also help those who have been called to serve as ministers or elders to be accountable to their fellow elders and ministers. When one is ordained into the office of an elder or pastor they declare to their fellow elders or ministers their subscription to the confessions and by doing that they are in essence saying, “Brothers, I believe the same things you believe and what our forefathers in the faith have always believed over the centuries. If at any time my life or my teaching is not in agreement with these truths, please hold me accountable. Show me my error and help me back on the path of truth.” The confessions and catechisms, therefore, help elders or ministers to be brother’s keeper. You are welcome my brother. Blessings in Christ.